All six members of the Expedition 45 crew aboard the International Space Station will participate in a news conference at 10 a.m. EST on Monday, Nov. 2 to mark the start of continuous work by humans aboard the space-based laboratory 15 years ago. The 30-minute news conference will air live on NASA Television and agency’s website. Station Commander Scott Kelly and Flight Engineer Kjell Lindgren of NASA, Flight Engineers Mikhail Kornienko, Oleg Kononenko and Sergey Volkov of the Russian Federal Space Agency (Roscosmos) and Flight Engineer Kimiya Yui of the Japan Aerospace Exploration Agency will take questions from U.S., Russian and Japanese media during the news conference. 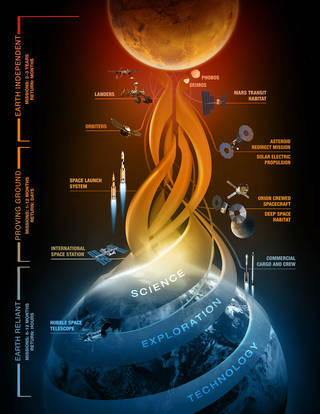 Due to time limitations, questions will be taken only from media participating in person at NASA’s Johnson Space Center in Houston or the agency’s Kennedy Space Center in Florida. International media accreditation for this event is closed. NASA launched a new website Monday so the world can see images of the full, sunlit side of the Earth every day. The images are taken by a NASA camera one million miles away on the Deep Space Climate Observatory (DSCOVR), a partnership between NASA, the National Oceanic and Atmospheric Administration (NOAA) and the U.S. Air Force. Once a day NASA will post at least a dozen new color images of Earth acquired from 12 to 36 hours earlier by NASA’s Earth Polychromatic Imaging Camera (EPIC). Each daily sequence of images will show the Earth as it rotates, thus revealing the whole globe over the course of a day. The new website also features an archive of EPIC images searchable by date and continent. New findings from NASA’s Mars Reconnaissance Orbiter (MRO) provide the strongest evidence yet that liquid water flows intermittently on present-day Mars. Using an imaging spectrometer on MRO, researchers detected signatures of hydrated minerals on slopes where mysterious streaks are seen on the Red Planet. These darkish streaks appear to ebb and flow over time. They darken and appear to flow down steep slopes during warm seasons, and then fade in cooler seasons. They appear in several locations on Mars when temperatures are above minus 10 degrees Fahrenheit (minus 23 Celsius), and disappear at colder times. A global ocean lies beneath the icy crust of Saturn’s geologically active moon Enceladus, according to new research using data from NASA’s Cassini mission. Researchers found the magnitude of the moon’s very slight wobble, as it orbits Saturn, can only be accounted for if its outer ice shell is not frozen solid to its interior, meaning a global ocean must be present. 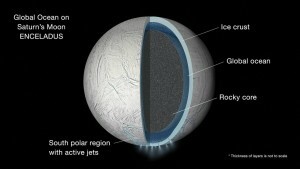 The finding implies the fine spray of water vapor, icy particles and simple organic molecules Cassini has observed coming from fractures near the moon’s south pole is being fed by this vast liquid water reservoir. The research is presented in a paper published online this week in the journal Icarus.